In 1934, Charlotte Nichols Greene of Boston purchased a set of carillon bells that had been part of the Belgian government's exhibit in the "Century of Progress" Exposition at the Chicago World's Fair. Numbering 36, the bells were cast by the Michiels Foundry in Tournai, Belgium, and were installed briefly in Mechelen, Belgium, before being shipped over for the World's Fair. 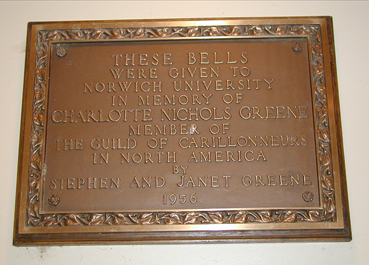 Shortly after acquiring the bells, Mrs. Greene donated them to Harvard University, but they were never installed. 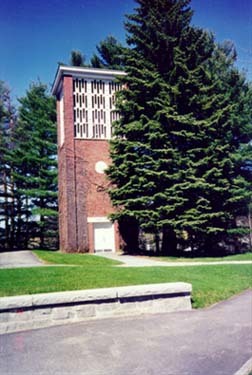 After Mrs. Greene's death in 1956, her son, Stephen Greene, and his wife Janet, of Dover, VT, donated the carillon to Norwich. Susan Adams Boyer of Riverton, a lover of music and generous patron of the arts, funded the construction of a 50-ft brick and steel tower as a memorial to the mother of her late husband, Dr. Porter Hartwell Adams, 16th president of Norwich. 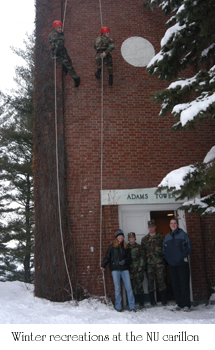 Construction began in fall 1956, and by December the Jeannie Porter Adams Memorial Tower was complete. The first concerts were performed that winter by Robert Donnell, resident carillonneur of the Peace Tower Carillon in Ottawa, Canada. Professor Arthur Lynds Bigelow of Princeton University, a world-renowned "campanologist" and this country's premier carillon designer at the time, played at the 1957 Commencement. In 1958, based on Bigelow's recommendations, 27 of the original bells were sent to the Paccard Foundry in Annecy, France, to be either re-tuned (5) or recast (22). In addition, 11 new bells (5 lower basses and 6 higher trebles) were purchased, bringing the total to 47. At the same time Bigelow built a new clavier. Still in use today, it remains a supreme example of the master's finest work. After the expansion, Norwich could claim proud ownership of a "grande" carillon, comprised of four full octaves of perfectly matched, tuned and blended bells, (minus the lowest E3 and F#3 bells). A prolonged period of disuse followed, during which weather and air pollutants took their toll on the transmission mechanism, rendering the instrument virtually unplayable. A complete overhaul in 1996, along with regularly scheduled maintenance, now keeps the musical quality of the instrument up to the finest standard in the country.